Alex Honnold is a climber that has done some pretty amazing stuff. His trademark is the saying, "no big deal." He says that about so much of the stuff he does. I relate to that pretty well. There are quite a few things I have done and for me, it really is no big deal. This expedition, as far as what I actually did over the last five weeks, it is insignificant. Woohoo, the Kalla Pattar speed record. Yet people are emailing me and telling me I'm an inspiration. I feel a lot of life is a reflection of our perspective. There are two types of people that get to Everest base camp, those that are only going to base camp and those that plan to go higher. 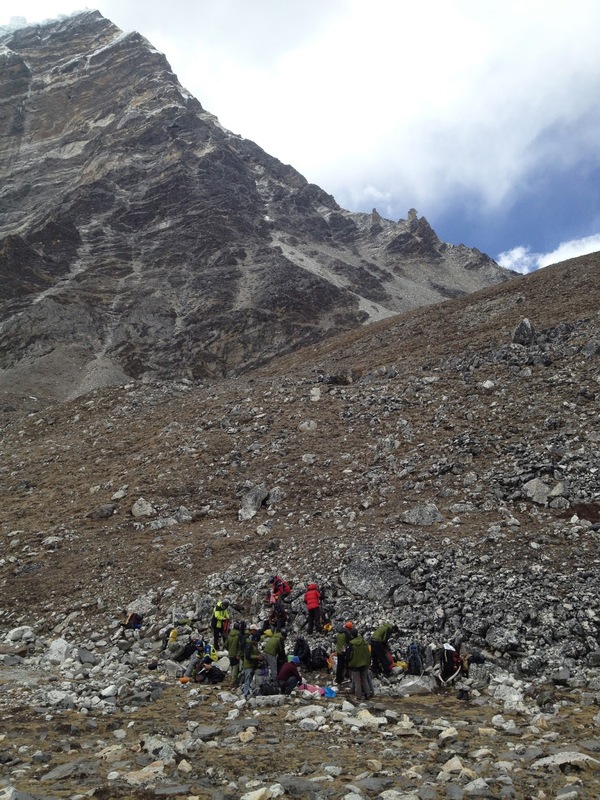 The trekkers who maxed out at base camp often seemed to be struggling and coughing and about ready to pass out. The climbers on the other hand would nimbly pass them walking off the trail with hardly a sound. The expectations of Everest climbers is that getting to base camp is almost insignificant (even though it is not to be taken for granted as we often do). For many trekkers it is the highest altitude they have been to. Our team at the last rest stop before crossing the Ampulapcha Pass, with the ridge to Ama Dablam in the background April 27th. It was the same with Mera Peak. Two people, one the day before and one the day we summited, got frostbite. What?! How does that happen on such an easy little peak? That's the difference, my perspective on a walk up 21,000 ft. mountain is totally different than a person who has never been to that altitude with very little experience. Mentally I spent months and years preparing myself for Everest, without bottled oxygen. It takes a long time to really get to the level where a big goal like that is realistic and possible for yourself. But once you build that mental fortress, everything else seems so much smaller. In the world of running races I say that "fast" is just what I haven't done yet. My fast is different than your fast. For me, the past five weeks, for the most part, has been no big deal. Obviously 16 people dying in a serac collapse and the resulting circus was a pretty big deal. It's very strange, I came here to push myself and see what I could do. Instead this ended up being more of a cultural learning experience. I think the biggest lessons I will learn from this expedition are about people and cultures. Certainly nice things to learn, but not the same sort of challenge I was prepared for. All of that being said, don't let me trivialize aspects of this experience that you don't understand, or that were simple for me because of my experience and preparation. I only wore gloves two days on this whole trip, the day we crossed the Ampulapcha Pass and Mera Peak summit day, because I ran with snowballs in my hands this winter. A Russian got frostbite on his fingers the day we summited Mera, yet I hiked down from 20,000 feet bare handed. For me no big deal, for this Russian, maybe he will lose part of some fingers. Nwang unloading his huge backpack at the tea house and camp April 28th, the day before we arrived at Mera Peak base camp.